And now comes the cleanup. 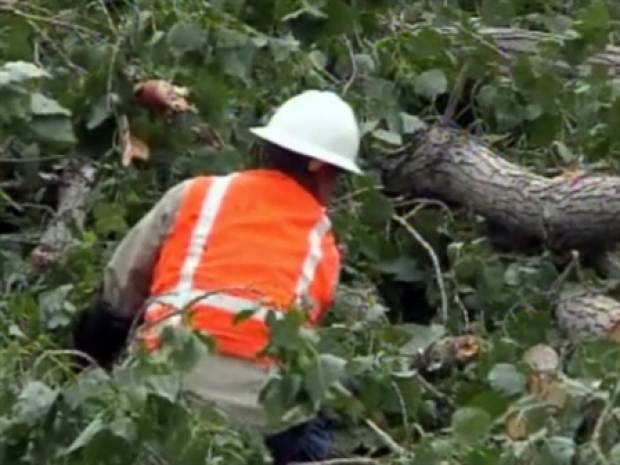 North Texas is still cleaning up after massive spring storms tore through the area Wednesday night. More storms were expected Thursday, but stayed to the south, sparing the Metroplex further damage. As of 5:50 p.m. Saturday, around 15,000 residents still were without power, according to Oncor officials. Most of those without power are in Dallas County. The original number of those without electricity peaked at about 260,000. Oncor said the storm ranks as the third worst in their history in terms of outages, but as of Saturday morning, claimed 90 percent of customers had power restored. Officials speculate that it will take through the weekend before service is restored to everyone. 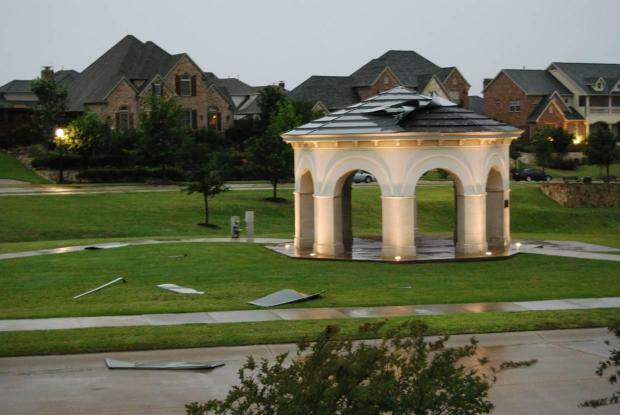 Many parts of Flower Mound, which was hard hit by wind damage, were still without power Thursday night. With street lights out, entire neighborhoods were completely in the dark. Families who had been without power for a day cleaned out their refrigerators and coped with the loss of electricity -- and air conditioning. 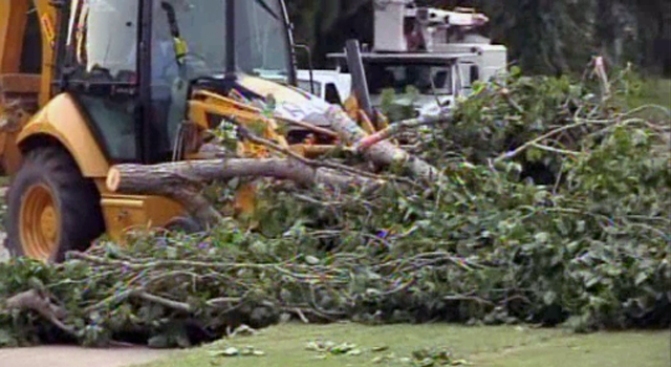 It will take days to clean up all the tree damage alone in Flower Mound. Some residents said they were frustrated by what they believed was the slow pace of restoration. "We have no air, we have thrown away hundreds and hundreds of dollars worth of food," Yvonne Jefferson, 39, of DeSoto, said. "We have been without power since Thursday. Nobody is willing to help." Residents also were worried about neighbors who rely on oxygen or have other health problems. 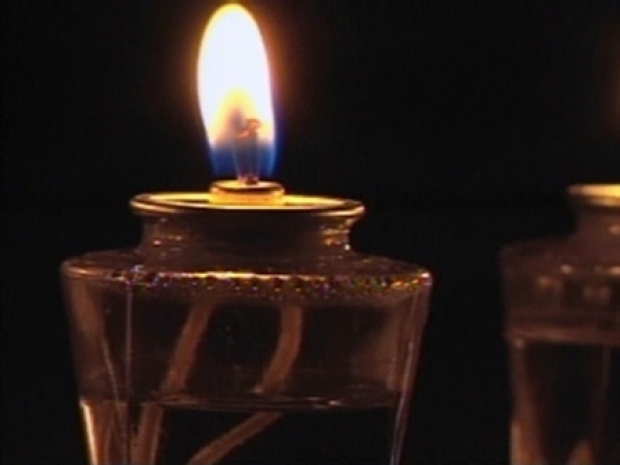 About 180,000 people were still coping without electricity Thursday night. "It is hot," Eva Austin said from her darkened apartment complex. "It's a mess." In Dallas, Lakewood resident Sandy Ellis and most of her neighbors have been without electricity since Thursday morning. "I have candles going, flashlights everywhere, in every room," she said. Restaurants such as Snuffers on Greenville Avenue even had to turn away hungry customers. "People have been pulling up all afternoon," said Greg Watson, general manager. "I am having to shoo them away, because there is no power." While neighbors insist water would not have risen so high if the Trinity River levee pumps had worked as they should, a deluge is also to blame for Dallas flooding. Next door, the Granada Theater improvised. "We’ve got about 400 candles and an artist that’s willing to play," owner Mike Schoder said. So the show went on, in the dark. Oncor has called in additional help from Louisiana, Missouri, Alabama, Houston and Oklahoma and that an additional 2,600 employees and contractors have been put to work. A company representative said crews are working around the clock to get power restored as quickly as possible. "Hopefully, our electricity will come on soon, because I really don't want to go to a hotel," Ellis said as she lit another candle. 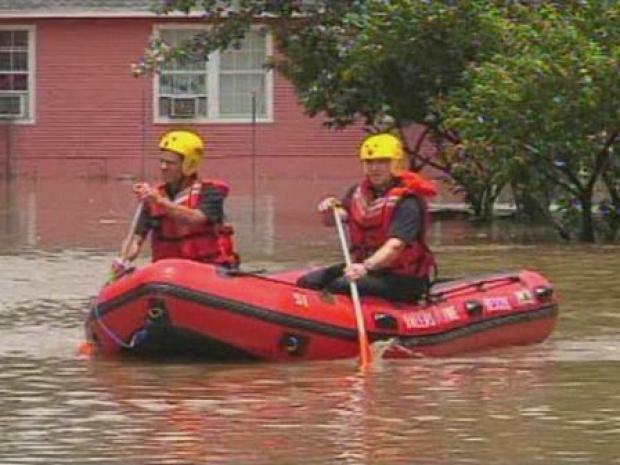 The heaviest rainfall was in downtown Dallas, where 8.23 inches of rain fell at Fair Park in a 24-hour period and 7 to 8 inches accumulated during the day in other parts of the city, said National Weather Service meteorologist Daniel Huckaby. Lightning struck one of two pumps that moves the groundwater from a west Dallas nieghborhood into the Trinity River at about 9 a.m. City crews were trying to repair the pump. The other pump was doing the work of both, but much slowly, city spokeswoman Danielle McClelland said. 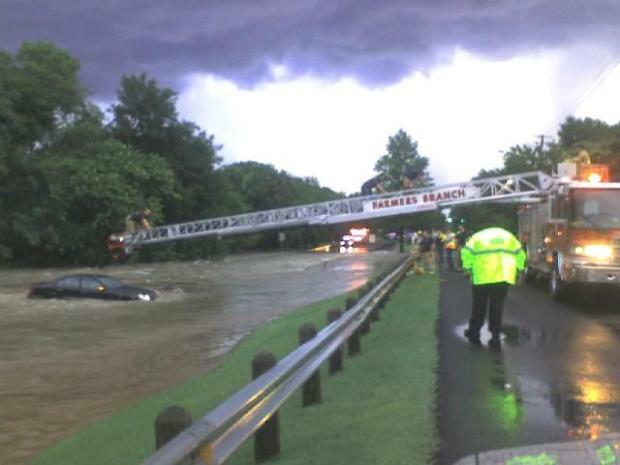 West Dallas saw flooding Thursday because of the heavy rains. But no one had checked into city shelters as of Thursday evening. Forecasters recorded 2.70 inches of rainfall at DFW Airport on Thursday. That broke the 1945 record of 1.19 inches, Huckaby said. No deaths or injuries were reported from the storms, which began whipping the Metroplex with winds up to 70 mph Wednesday night. Thunderstorms continued moving through the region Thursday and started to clear by mid-afternoon after dumping more than 8 inches of rain on parts of Dallas County. More than 400 flights were canceled Thursday at Dallas-Fort Worth International Airport before it resumed operating later in the day. Southwest Airlines, which flies out of Dallas Love Field, canceled 21 flights Thursday because of the weather -- 15 of those were in Dallas. Another 13 planes were diverted in the height of the morning's storms and dozens of flights were delayed across the country, said Brad Hawkins, a Southwest spokesman.